Open the recycle bin by pressing the Windows Key+M and then double clicking on the Recycle Bin. Also, you can open "My Computer" and find a link to the Recycle Bin on the left hand side. To restore a file, right click it and click on "Restore". To restore several items at the same time, click and hold on CTRL while selecting all the files you wish to restore. After you have done that, right click and select "Restore." The files will be restored to their original locations. If you deleted a file from the Recycle Bin, use this program (Undelete) to restore the file(s) you deleted. This program works because when you delete file(s) from your hard drive, they're not really gone because the operating system has just marked that space on the hard drive as blank, even though the file(s) is/are still there until they get overwritten by new files and programs. The program simply finds what the operating system is currently ignoring and tells you if the file has been overwritten with something new (this is also why professionally erasing your computer's data before giving it away or throwing it out is so important; an article on this topic is coming soon). If you want to know more information about the file(s) in the Recycle Bin, right click the "Name" tab in the Recycle Bin window and select the other attributes you wish to see for all the Recycle Bin files. You can also click on the Name, Size, Type, and other tabs to sort them by their name (alphabetically), size (largest to smallest), type (pdf, jpg, mp3), and for any other attributes. Using System Restore: System Restore attempts to reset your computer's state back to to that of your latest restore point. 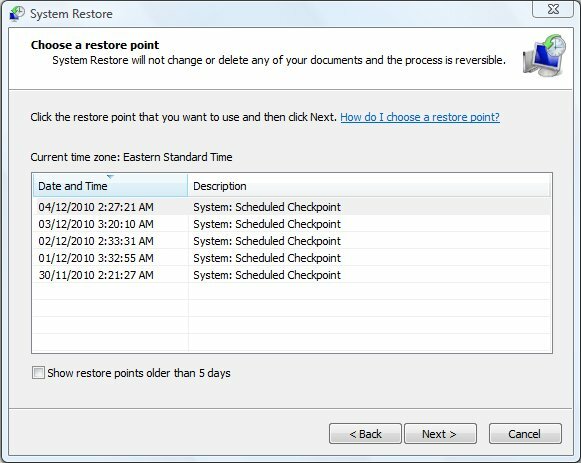 Restore points are created regularly and save the computer's state at one particular time. Please note: restore points typically do not restore deleted files. Use System restore when in Safe Mode or when things get bumpy with your computer and you have registry problems, conflicting hardware and/or software settings, have accidentally downloaded a virus, and other problems. To use System Restore, go to Start, All Programs, Accessories, System Tools, and then System Restore. Remember that if the System Restore doesn't fix any of your problems, you can always undo the system restore by going back to the System Restore wizard under System Tools. I recommend backing up and updating your files regularly on an external hard drive. Simply copy and paste all the files and folders you wish to save and put them on your external hard drive to restore them at a later time. 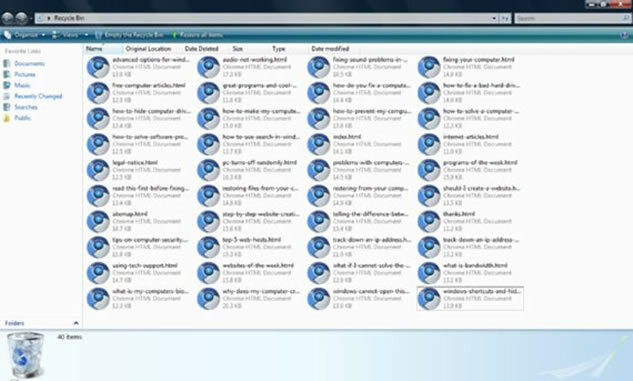 If your computer is really in need of a good restore, try repairing the Windows installation by loading up the Windows XP installation disc or the manufacture's discs at Startup and then selecting Enter to install and then repair (if you have Windows Vista or 7, try pressing F8 before Windows loads at computer startup and selecting the repair option). If this doesn't work and you really need your files back (and Windows doesn't work), you can boot up a Puppy Linux (article on Booting up Puppy Linux coming soon) to put your files on an external hard drive so that you can completely reformat your hard drive and reinstall Windows. Thanks for reading my article on restoring files from your computer.